My career has focused on issues of both food safety and food security – two concepts that sound extremely similar but are actually quite different. My family members often get them mixed up and can’t remember which is which, so I thought I’d lay out the definitions to help clarify. I’ll be discussing topics within both disciplines on my blog, so best to get the basics out of the way! The discipline of food safety deals with the proper handling, preparation, and storage of food with the goal of preventing foodborne illness. Foodborne illness (aka “food poisoning”) may be caused by bacteria, viruses, molds, parasites, heavy metals, or contaminants that make our food unsafe to eat. You’ve probably heard of some of the most common foodborne pathogens: Salmonella, E. coli, Norovirus, etc. Food safety standards and processes are very important all along the supply chain from the farm to your table. When a food company discovers that one of its products is unsafe, it may recall that item. Unfortunately, minor food safety incidents are ubiquitous – we’ve all experienced the tummy aches or worse – but standards and inspections are in place in the United States to guard against major issues. Of course, fresh food can never be 100% insulated from pathogens, and so the consumer needs be conscious of some basic safety rules such as proper cooking, storage, and reheating temperatures. The heading of food safety also includes food defense, which is the protection of our food supply from criminal or terrorist interference. FoodSafety.gov – A U.S. federal government site that contains recall information, food poisoning basics, and tips on how to keep your food safe. Food Safety News – A robust online newspaper covering the latest news and views from the food safety beat. Codex Alimentarius – International food safety standards that influence trade. Food security is more closely aligned with what you may think of when you hear the word “hunger.” If you or your household are food secure, you have a consistent, adequate supply of safe and nutritious food for an active lifestyle. If you are food insecure, then you have a limited or uncertain ability to acquire the food you need to be healthy and active. Improving food security is not just a matter of providing food aid to the poor (in the form of actual food or money to purchase food), although this type of aid is very important in times of famine or disaster. International development organizations, governments, and non-profits need to work together to establish good policies, markets, and supply systems that allow all people to produce and/or purchase the food they need. Food security is intimately linked with issues of economic growth, nutrition, and natural resource management, among others. Although many people think of hunger and food insecurity as problems that reside in developing countries, they are real problems in the United States as well. The U.S. Department of Agriculture estimates that 14.5 percent of American households were food insecure at least some time during the year in 2012. Once you know the term food security, you will start seeing it frequently. With the Earth’s population expected to reach 9 billion by 2050, it seems like everyone is talking about global food security and how to feed the world (which is fantastic!). FAO document: An Introduction to the Basic Concepts of Food Security – This is a very helpful 3-page brief that I have shared with students and friends who need a good intro. 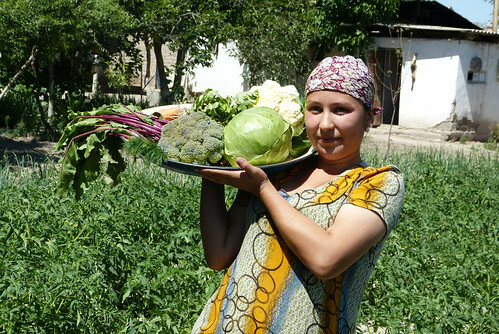 Habiba Tukhtaeva shows off the vegetables she grew in her family’s kitchen garden with support from Feed the Future. So how are food safety and food security related? You can’t have true food security without food safety – after all, contaminated or unsafe food is certainly not adequate for a healthy and active lifestyle free from hunger. Poor food safety measures can affect the availability of food, since spoiled/unsafe foods should be removed from the supply chain.